The Kumano-no-Honji handscrolls are a set of three. The handscrolls belong to a genre of illustrated religious literature that describes the Buddhist origins of local Japanese deities (kami). The scroll recounts the genesis of the gods as Indian Buddhist royalty who experience treachery and persecution, fly to Japan, and apotheose as the deities of the Kumano Shrines. In the 11th century the Grand Shrines of Kumano Sanzan became a pilgrimage destination for the imperial family and aristocrats. By the late 15th century, the majority of pilgrims to Kumano were commoners. The Kumano Shrines are located in the Kii mountain range south of Nara, which was the capital of Japan from 710 to 794. 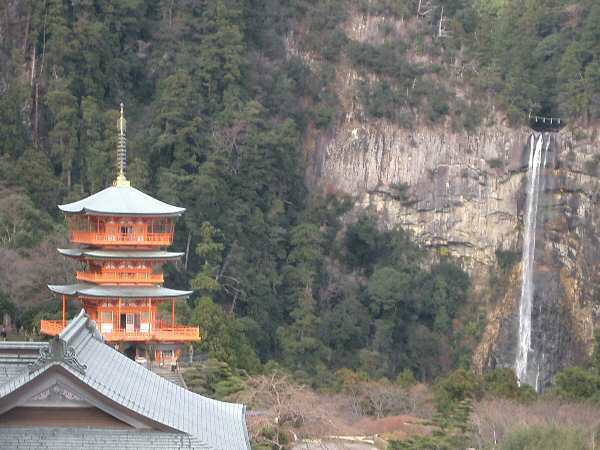 Three main shrines, are connected by a pilgrimage route, Shinto indigenous beliefs linked the Kumano region with the origin of the Japanese people. Buddhist missionaries later imagined the area of the shrines as the earthly paradise of the bodhisattva of compassion, Avalokiteshvara (Kannon in Japanese), incorporating Buddhist beliefs and tales of Indian origin into the local religious landscape. …Otogizoshi-tales flourished in Japan during the medieval period. India was known to Medieval Japan as the place where Buddhism and its originator, Shaka (Lord Buddha). As a result, proper nouns like India (Tenjiku) and names of places were found mostly in the Buddhist context. The first story to be introduced in the is paper is called ‘ Kumano-no-Honji’. This is a story that traces the origin of the Gods in Kishu (presently Wakayama Prefecture in Japan) from India (Tenjiku) to Japan. The worship of Kumano Sanzan (Three Sacred Shrines of Kumano) was started in the imperial family of Kyoto and the nobilities after the mid-Heian Era and spread in the masses during the medieval period. Situated in the Kii Peninsula that lies to the South of Kyoto, the three shrines of Kumano Honsha, Kumano Shinha and Kumano Nachi Taisha were worshipped since olden times. They were not considered as one set right from the beginning, but were grouped up in course of time. They were worshipped and with the syncretism of Budhdism and Shintoism, the Gods from Kumano Sanzan were also provided with a Buddhist explanation. ‘Kumano-no-Honji’ is a story that has been created considering the confluence of Shintoism and Buddhism. “Honji” is a concept devised by Japanese Buddhists that explained the correlaton between Buddha and Japanese Gods (Kami). Japanese Gods (Kami) that existed in the soil of Japan before Buddhism arrived were considered to be reincarnations of Lord Buddha who came to salvage the masses. Thus, the explanation stressed that Kami was Buddha and Buddha was a reincarnation of Kami. However, following the popularization of the concept, ‘Honji’ was considered to be “A story that depicts how a human being, after undergoing various difficulties, was able to become Buddha due to the divine protection of Kami and Buddha”. 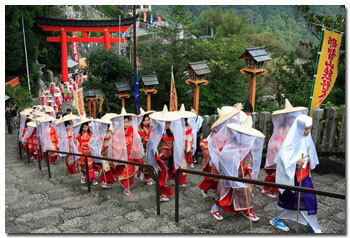 Thus, ‘Kumano-no-Honji’ means “The story that explains how the Kumano Gods became Gods”. Zenzai, the King of Magadha, situated in central India, had 1000 wives, but was not blessed by a son. 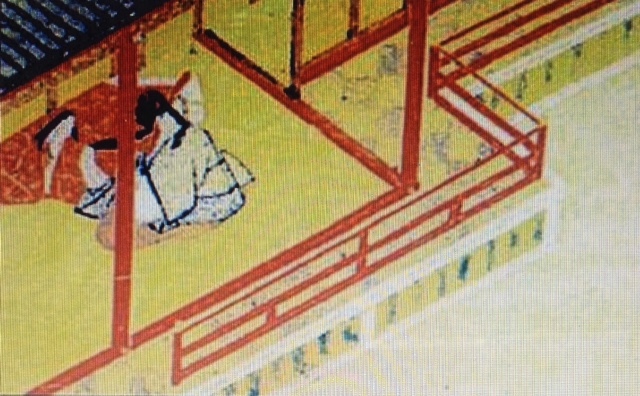 Senko, a queen who lived in the Gosui palace, prayed to Goddesss Kannon-Bosatsu (Avalokiteshwara) in order to be blessed by the king’s affection. The Buddhist Goddess of mercy blessed her, and she conceived a baby on receiving the King’s affection. The King was overjoyed as he was able to have the long cherished Prince, but the other queens were jealous of Senko. They cast a charm on Queen Senko and brought an astrologer who gave a false prediction that the “child in Queen Senko’s womb will bring about the fall of the empire”. These plans failed , but the thousand queens disguised into witches and attached the King’s Gosui Palace, and the King left Queen Senko. The queens called the knights, forged a false royal order, and took Queen Senko into the deep forests of the mountain for execution. The Queen delivered a son just before being executed, who grew on the milk of his dead mother, protected by animals of the jungle. When the prince was three years old, the Queen’s elder brother Chiken, who was a priest, entered the jungle and found out the prince. He took him to a monastery at the foothills of the mountain, educated him and planned a meeting of the father and son when the prince became seven years old. Soon the Queen was also brought to life by the magical powers of the priest; the lot of the queens was disclosed and all of them were punished. King Zenzai, along with Queen Senko, the prince, priest Chiken, and the retainers, decided to travel to Japan, rode on a vehicle that flew in the sky, reached Kumano in Japan and became the Gods of Kumano. The king is beleied to be the reincarnation of Amida Nyorai (Lord Amitabha), the Queen that of Kannon-Bosatsu (Goddess Avaokiteshwara) and priest Chiken of Yakushi-Nyorai (Bahasajhyaguru). It is said that Amida-Nyorai is worshipped as the Honji at the shrine of Kumano ongu, Kannon-Bosatsu at Kumano Shinu and Yakushi-Nyorai at Nachigu. The brief outline of the story mentioned above shows that if the sentence “Zenzai, the king of Magadha stayed in central India…,” is not found at the beginning, it is hard to distinguish that the story takes place in India and the characters are people of India. It can also be mistaken as a story that has the Chinese or Japanese royal family as its main characters. This is because the actual story does not have any elements that would make the presence of ‘India’ felt in it. What would be the situation if the illustrations that accompany this story are considered? Let us see the depiction of Tenjiku (India)given in ‘Kumano-no-Honji Emaki’ (The Picture Scroll of Kuma-no-Honji) which is preserved in the Kumata Shinto shrine. 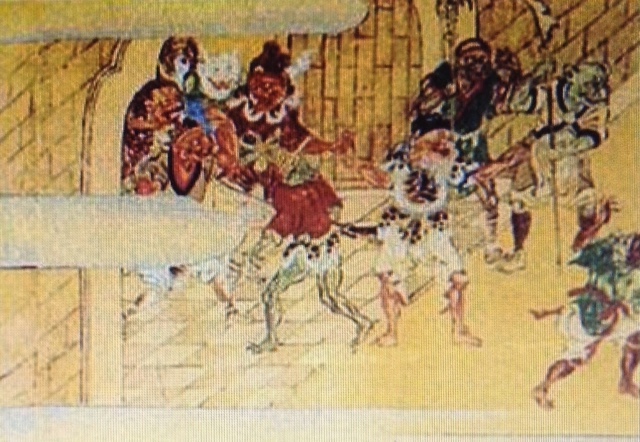 Picture 1-A (shown above) shows the scene when the queens, disguised as witches, are annoying the King who has come to stay at the Gosui Palace where Queen Senko lived. King Zenzai and Queen Senko are surprised at the appearance of the witches. And Picture 1-B and Picture 1-C are the same scenes from another text of Kuma-no-Honji. Their apparel of Picture 1 seems to be a mixture of Japanese and foreign (Chinese or Korean style) clothes. The palace architecture too, can be called as Japanese except for the use of red color paint that can be seen in one portion. This color can be called as an effort to distinguish the palace from the Japanese Palace. 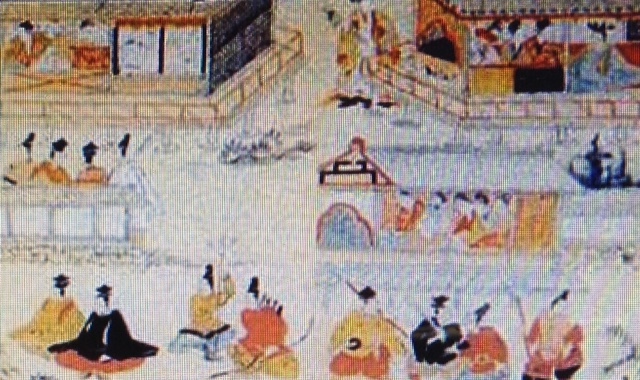 Picture 2 shows the scene when Queen Senko is taken away by the knights for decapitation. The weapon of the soldiers have somewhat foreign shapes, but their appearance is more or less similar to Japanese soldiers. In other words, it can be said that India’s image depicted in these pictures is more of a mixture of Japanese and Chinese imagination of India. If we consider this as reality, then that would mean that the medieval Japanese were not able ot form a concrete image of India. It was an image that was neither Chinese nor Japanese – and of course completely different from reality –an image of country that medieval Japanese called as ‘India’. Here, I would like to deliberate from a different perspective on the pictorial depiction of the foreign style palace architecture and costumes. The image of India seen in the aforesaid story of ‘ Kumano-no-Honji’ seems to originate from a blend of Japanese and Chinese architecture and clothing. However, this blending does not stop at the image of India only, but continues further a a broader image that was common in the depiction of ‘The Other World’ by medieval Japanese. The ‘Other World’ means a world that is on the other side of the everyday world of living beings. Beyond the day-today world, the Japanese have been imagining a world where Gods and goblins live. For example, they believed that there was a world above the sky that differed from the human world. At the same time, there existed worlds in the mountains, under water, on the other side of the sea, underground and even after death, a country (kingdom) of the dead existed for them. These worlds were even depicted in paintings throughout. The ‘Picture Scroll of Amewahiko Monogatari’ depicts one of Otogizoshi-tales that deals with royal palaces in the heavens. Amewakahiko was the son of the King of the world above the skies and the story is as follows. Amewakahiko goes to the human world in the form of a snake and asks a princess to marry him, after which he changes into a beautiful youth and appears in front of her. Both of them do spend the married life together, but Amewakahiko soon goes back to the skies. The princess who loves her husband follows him to the celestial world, goes through various tests that his father gives and finally there is a reunion. When we have a look at the illustration that depicts the royal palace of the celestial world, the architecture is of Chinese style (Picture 3), and the King in the Palace (Amewakahiko’s Father) is shown as a scary demon (Picture 4). I would like to deliberate slightly on the point that the royal palace of the celestial world is ‘Chinese -styled’. It seems that when it came to depiction of a world without human beings, the medieval Japanese were not able to imagine it independent of the image of Chinese, which was a country that had a lot of cultural interaction with Japan since ancient times. In the deep recesses of Oeyama, situated in northwest of Kyoto, a group of demons had their palace and a demon called Shuten-Doji was their chief . These demons would frequently appear in the capital of Kyoto and attack princesses and women of the royal families. The Emperor sends a general called Minamotono Raiko, who completely exterminates the menace of demons and is welcomed back to the capital after his triumph. The Picture 5-A and Picture 5-B are the same scenes from another text of ‘Picture Scroll of Oeyama Shuten-Doji’. The palace in either text is Chinese- styled. 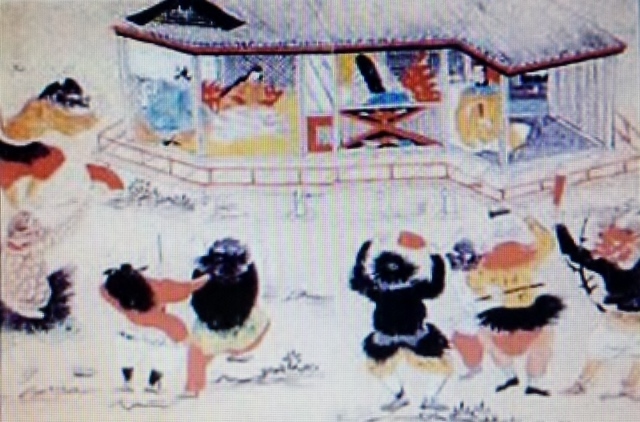 ‘Momotaro’, another famous Japanese fairy tale also has a similar scene of extermination of demons, which had a castle similar to that of Shuten Doji. Urashima, a fisherman who saves a turtle, is guided to the Dragon Kingdom by the turtle. He marries and settles there, but is reminded of his hometown after enjoying for some time and begs to return to his hometown to spend some time. He is given a small treasure chest as a souvenir and is told that he should not open it. When Urashima returns to his hometown he finds out that a few centuries have passed and the world has changed. A sad Urashima opens the treasure chest. As soon as he does this, a cloud of smoke arises from the chest and Urashima turns into an old man. If we see the pictorial depiction of the Dragon Palace that is described in this story, it is identical to that of ‘Amewakahiko’s Story’ or to Oeyama Shuten-Doji’, i.e. Chinese styled architecture and the residents of the palaces are people who are wearing Chinese style clothes. ‘Tawarano Tota’ is again a story of the hero saving the serpent (An Apparition from the Dragon World) and in turn being taken to the Dragon world, there he experiences the warm hospitality of the Dragon King and returns laden with gifts. However, the image of the palace in this story is still centered on the Chinese image. And what would be the world after death? Somehow, Japan has many pictures of Hell that depict the world after death. The enshrined deity of Kitano Tenmangu Shrine in Kyoto is supposed to have existed in reality. ‘The Charm of Kitano Tenjin’, a tale that describes the origin of this shrine says that Sugawarano Michizane was enshrined in this shrine as God in order to pacify his revengeful ghost. The smae story has an illustration depicting the Emperor suffering in Hell as he died of Michizane’s curse. The Master of Hell is God Yama, and his palace too is depicted as a Chinese-styled one (Picture 11, Picture 12). There is a distinct similarity in all these pictorial depictions and the illustrations provided in the story of ‘Kumano-no-Honji’. India, for the medieval Japanese, was a distant country–a different world altogether almost like the Celestial World or the Water World. I will introduce another piece from the genre of fairy tales. It is a story called ‘Shaka-no-Honji’. there are numerous works in Japan that include anecdotes about Shaka (Lord Buddha, the founder of Buddhism, also known as Shakuson or Shakyamuni) and references to His biography that is known as ‘ Butsuden’ in Japan. These tales were already popular in the masses in India, Chinese, Korea and Japan, and were even converted into illustrated stories. The Buddhist biographical scriptures that the ancient Japanese used were mainly those written in Chinese and even they were introduced as illustrated biographies. ‘Eingakyo( (Illustrated Sutra of Cause and Effect) is one of the most famous ancient works that was imported to Japan in the Nara Period (8th century AD). King Jobon, who lived in a castle named Kabira in India, did not have a son even at the age of 50. He got a prediction made about the way to obtain a son. As per the prediction, he invited Maya Bunin from the heaven to be his queen. She conceived the child in her sleep, and the baby was born. Buddha had come riding on a white elephant and entered the womb from the right side of her stomach. However, the mother died seven days after the birth of the baby and it was brought up by its aunt. At the age of seven, when the child saw a small bird bring up a chick, he got to know that he did not have a mother and felt a strong urge to become a priest and attain Buddhahood. On hearing this, the King invited 500 astrologers to predict the Prince’s future, out of which 499 predicted that he would become a king, except for one who predicted that he would become a priest shunning all pleasures and strive for the salvation of all living creatures. The King still tried to persuade the prince and built a beautiful garden — Garden of Four Seasons –that would in full bloom throughout the year. But when the Prince was enjoying his life in the garden, he met an old person who became ill and died as the time passed. The Prince was deeply moved on seeing the cremation of the old man who ultimately turned into bones and ashes. He visited a monk and felt futility of the human world after discussion with him. He told his father about his intentions to renounce the worldly pleasures. The King tried to persuade him by marrying him to the famous beautiful princess called Yashudara, who was his minster’s daughter. However, the minster put forth a condition that whoever wanted to marry his daughter had to piere seven iron targets by his arrow. Many suitors participated in the competition amongst which King Jobon’s nephew, Debadata, pierced five targets, but as the Prince’s arrow went through all seven, he got the beautiful princess in marriage. But as the Prince still had a very strong aspiration for Buddhahood, the Princess was unhappy. When the King promised the Prince that he would allow him to enter priesthood only when he got a son, he pointed at the Princess’ stomach and she conceived a child. At the age of 19, the Prince headed toward Mount Dantoku, leaving his palace behind. He met a saint (Saint Ararakarara), became a monk and continued penance for 12 years under his guidance. After that, he was given the Lotus Sutra and was told to go back and preach it at the foothills of Mount Kaya in the kingdom of Magadha. He became Shaka Muni at the age of 30 years. Devils started disturbing his penitence over there. After attaining Buddhahood, he met Shudatsu the millionaire who built the Gion Monastery for him. At the age of 80, his forehead showed a ray of light. He told his disciples that the time for his Nirvana had arrived and attained Nirvana in the night. As the story of Shaka-no-Honji’ is the biography of Lord Buddha, many Japanese know that the story is based on an Indian background. However, the understanding of the contents was done through a filter of ‘ Japanese Culture’. In other words, the story was adapted in such a way that if the names of characters and places are changed in to Japanese names, it would become a story of a Japanese Prince who is in search of Truth and Realization. The outline of this story of ‘Shaka-no-Honji’ is based upon Buddhist Scriptures from China. A similar outline can be seen in Buddha’s biography depicted in the wall paintings at Dunhuang in China. In that sense, ‘Shaka-no-Honju’ can be called as the Japanese versions of Buddha’s biography from China. The Castle of Kabira is Kailavastu in Nepal, King Joubon is Shuddhodhan, his Queen Maya Bujin is Goddess Maya, Buddha’s wife Yashudara Yashodhara and Debadata is Devadatta. The names have been quite similar to the original Sanskrit names as they were assigned Chinese characters considering their meaning and pronunciation. Let us see the pictorial depiction of Shaka and his Royal Palace as depicted in ‘Shaka-no-Honji’ which is preserved in Kotohira Shinto shrine. At a glance we can understand that the depiction is almost similar to those images of ‘The Other World’ that we have seen so far, i.e. Chinese styled palaces with people wearing Chinese styled clothing (Picture 13, Picture 14). The story of ‘Shaka-no-Honju’ is an important piece of knowledge for the Buddhists and was passed on through various mediums. For example, the ‘Depiction of Buddha’s Nirvana’, a painting that depicts the scene of Buddha’s death, was painted as wall paintings in temples and also used as hanging scrolls. Even the ‘Painting of Eight Scenes’ that depicts eight major scenes selected from Buddha’s life was often drawn. In spite of this, Buddha’s story and India’s image were already depicted in China in the Chinese manner. They were adapted in such a way that it suited the Japanese context and were depicted in an increasingly Japanized manner. These concepts were visualized on the basis of the Cosmology of the Japanese people of those days, that is ‘ The Other World’. Nothing could really broaden the image of India more than that of being a far off land where Buddhism was born. Thus the images of ‘The other World’ and India found in the fairy tales were drawn with the help of images of China, the sole neighbouring country whose reliable knowledge was available. Thus I would like to put forth some simple conclusions through this paper. Medieval Japanese painters, who were asked to draw illustrations for fairy tales, particularly those having India as their background, tried to depict buildings, hair styles and costumes of characters with reference to the paintings drawn on the ‘Other World’. Moreover they tried to evolve an image that was all much more India, or rather all the more unworldly, there is an impression that they must have visited temples and referred to Chinese traditional paintings, Buddhist paintings or illustrations from Buddha’s biography.